Every college student groans when they look at their booklist for the upcoming semester. Some of us are lucky enough at SNU to be able to get our textbooks and materials (i.e. lab fees, etc.) for less than $100 online, but most of us have to hand over $200 or more to pay for books every semester. Many of these materials we will not use again. Regardless of what drives the costs of the textbooks and other class tools, here are a few things that college professors should do to help their students get the most for their money. 1. Tell his/her students before the semester begins if the textbook and materials will be used in later courses or helpful in their careers. 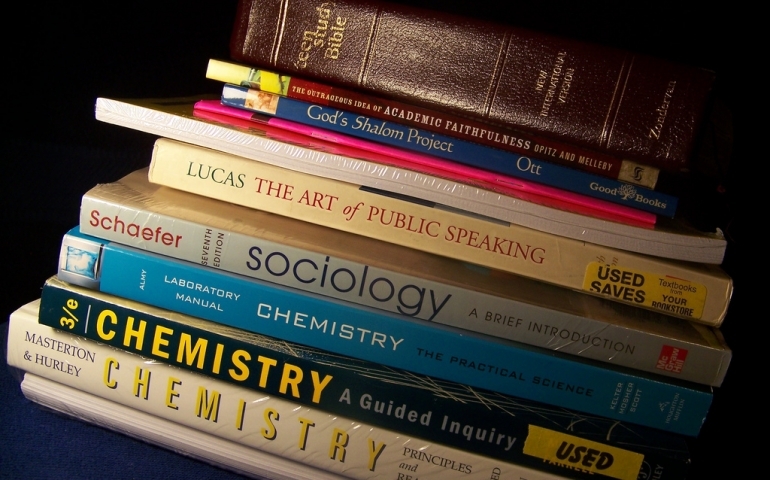 Many students are not aware of the fact when they order their books before the first class period that the textbook will be used in a later class on their degree path, and so they opt for renting their textbook. As a result, the student has to spend more money than is necessary to buy the book after the semester is over. A simple email sent before the semester begins telling students what materials they need and which ones are particularly important for their degree/career can not only create gratitude in students, but also lessen their frustration. 2. Don’t require excess books. Professors who are new to teaching a course may require more books or materials than will actually be used in the course, which is perfectly understandable given the circumstances of what may happen in a semester. However, if the professor has taught the class at least once beforehand and understands that he/she cannot get to that material within the semester, he/she should not expect the students to buy those books. Many students cannot afford to spend even the $10 to $15 extra for a book that will only be used once, even those who have jobs. 3. Don’t require technology that the school cannot provide. Education is fast moving toward the use of as much technology as possible. Yet many schools in Oklahoma and all across the United States cannot provide their students or their teachers with updated technology to enhance the learning experience. The same can be said for many colleges, and so when a professor expects students to purchase technological tools to be used only in one class, the student feels as if he/she has wasted his/her money. If a professor believes he/she can best instruct his/her students only if the student has this technology, then he/she should attempt to get the technology funded through grants or through funds from the department. If professors take these steps to minimize the costs of going to school for their students, chances are the complaints about the costs of textbooks around campus will go down and students will start the semester with a fuller bank account. Have some more advice for professors regarding this subject? Leave suggestions in the comments section below. Prev PostParking Issues: What’s the Deal?